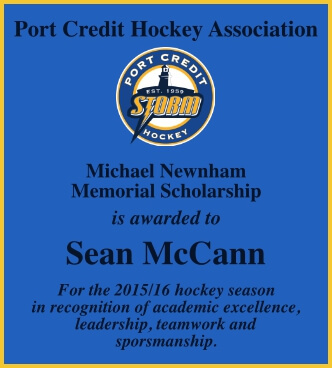 Michael Newnham passed away in a tragic accident on November 23, 2013. 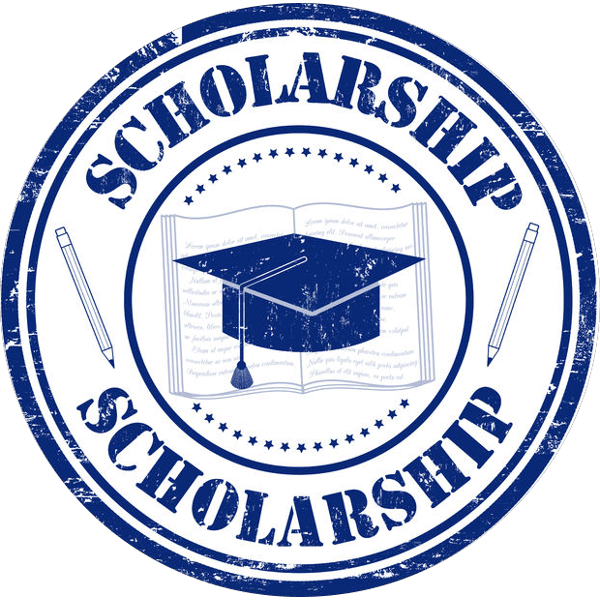 Michael was a popular student who attended Lorne Park High School, where his exceptional athletic ability saw him play on the rugby, football and ice hockey teams. Michael was also an important part of the Port Credit Storm Hockey organization for four years, which was highlighted by his captaining his team to an MHL and Greater Toronto Play-down Championship in 2011 – 12. 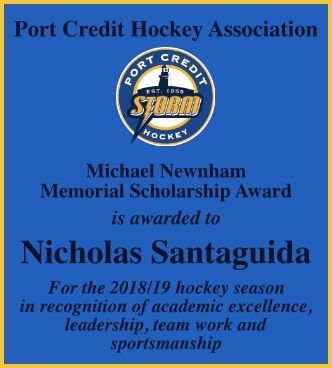 Michael’s hockey legacy will be his tremendous hockey talent, commitment to winning and the leadership he provided his team on a consistent basis. 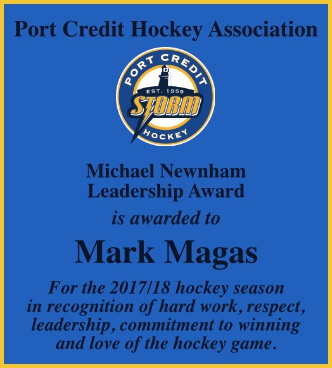 His enthusiastic, playful disposition, combined with an on ice fearlessness and a passion to win hockey games made Michael a special player and leader to his team-mates. 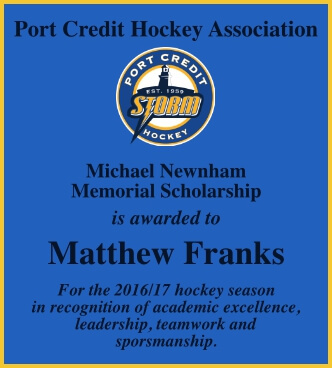 In addition to this memorial scholarship, Port Credit is proud to recognize Michael by naming the annual Port Credit Coaches Game, The Michael Newnham Memorial Coaches Game in his honour. 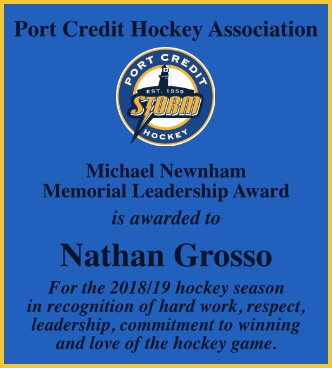 As well, The Michael Newnham Leadership Award, has been established, to recognize the Port Credit “A” hockey player that best demonstrates the characteristics of hard work, leadership, and commitment to winning, that Michael always brought to his team. Born in 1951 and growing up in the rural Ontario town of Ridgetown, Bob “Mr. 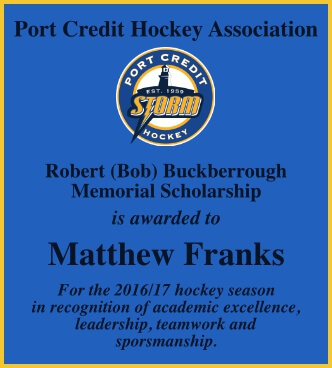 Buck” Buckberrough developed a passion for sports, particularly hockey and baseball. The community atmosphere of Port Credit reminded him of his hometown. 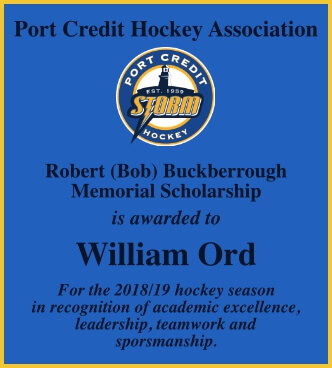 Bob became involved with the Port Credit Hockey Association when his three sons, Dax, Tory and Wade began playing hockey. Being the consummate organizer that he was, Bob took on the role of soliciting sponsorships and through his hard work and devotion to amateur sport, quickly established commitments for each and every team. 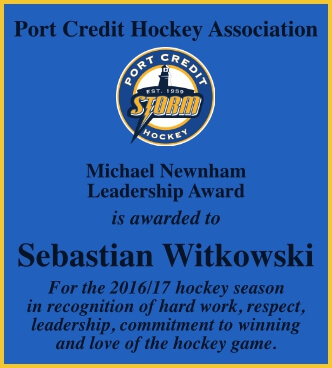 He always supported PCHA activities including the planning and organizing of the 40th and 50th anniversary celebrations. Bob was passionate about the success of all PCHA teams and his greatest pleasure was watching children of all skill levels play our national game. Bob passed away in July 2014 as a result of complications from cancer treatment. This scholarship recognizes Bob’s many contributions to the Port Credit Hockey Association.